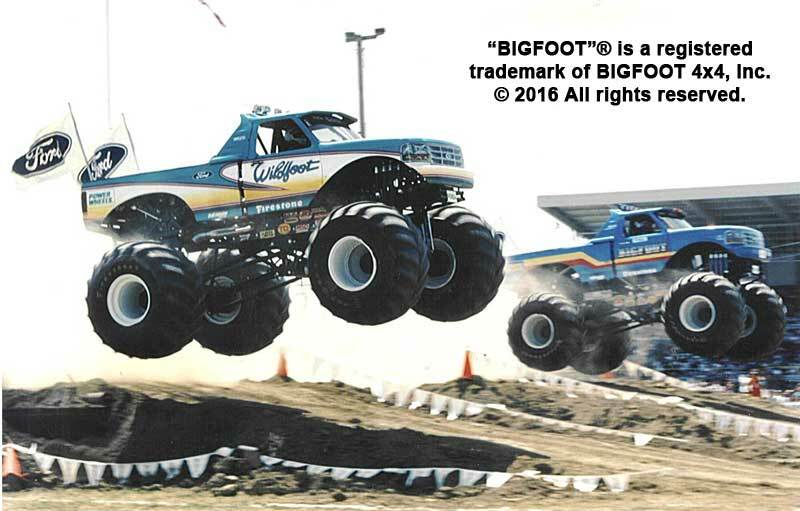 The story of the BIGFOOT monster trucks and their creator, Bob Chandler, truly is a personification of the American dream. 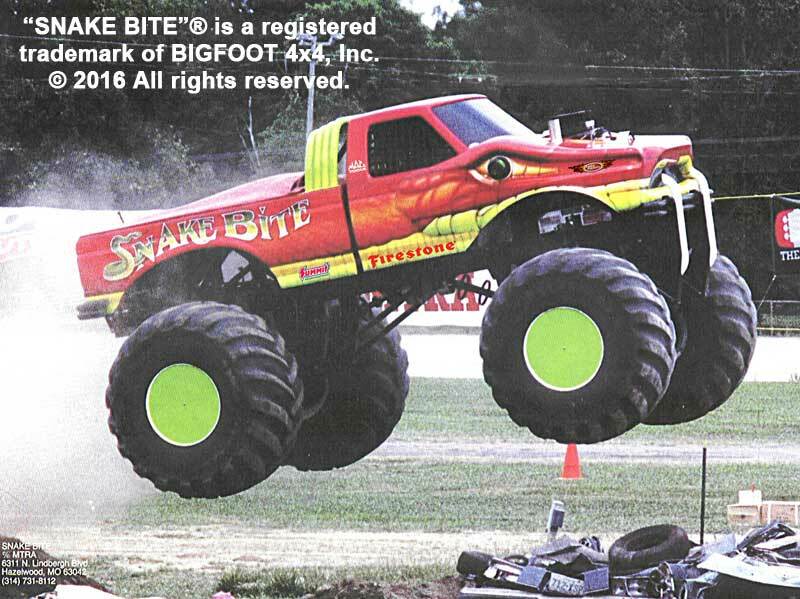 Chandler not only achieved unparalleled success in the monster truck industry, but actually fathered the industry itself. 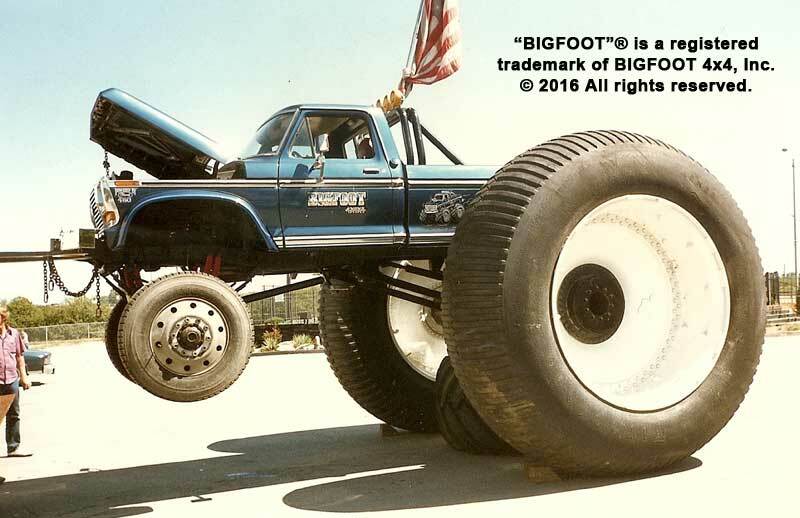 And while Chandler and his BIGFOOT team now enjoy international recognition and a great deal of success each year, their path to greatness began with a very humble start. 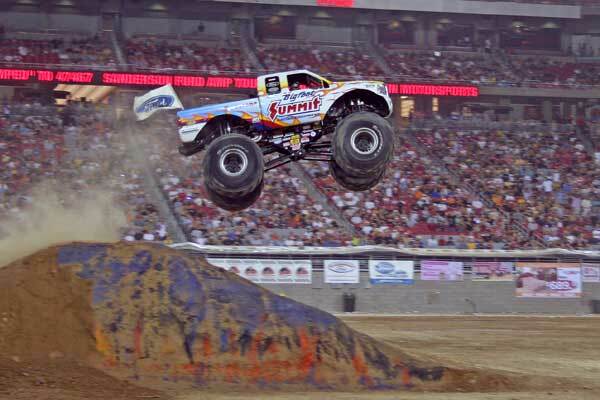 Chandler spent his early years in the St. Louis, MO area, eventually moving to California, where he attended high school. 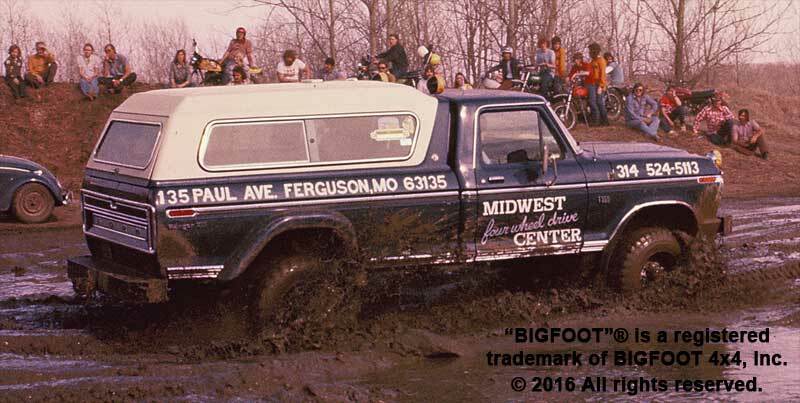 After a stint in the US Navy, Chandler returned to St. Louis to take up the family vocation as a construction site manager and carpenter, and in 1965 he married his wife Marilyn. 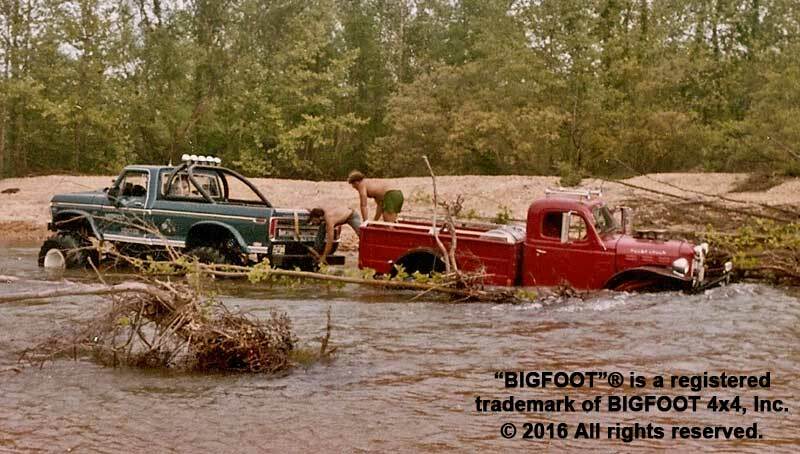 Bob and Marilyn enjoyed the great outdoors and camping, so in 1974 they ordered a brand-new F-250 pickup truck to enhance not only their cargo capacity but also their off-road capabilities. 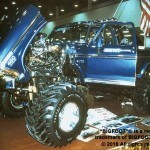 It was not long before Chandler became frustrated with the lack of available parts and services in the St. Louis area for 4×4 owners such as himself. 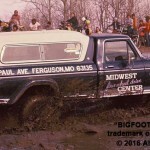 In lieu of that, Bob and Marilyn partnered with neighbor and long-time friend Jim Kramer to form Midwest Four Wheel Drive, which had its grand-opening in 1975.
Business quickly took off, and within a couple of years Midwest Four Wheel Drive had out-grown its facility in Ferguson, MO, eventually re-locating to nearby Hazelwood. 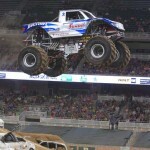 Chandler’s F-250 became the de facto company vehicle, running errands and delivering parts for the fledgling shop. 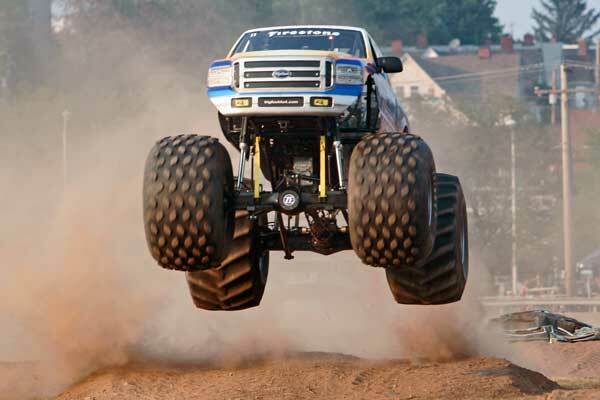 Chandler’s continued interest in taking the vehicle off-road inevitably led to parts breakage, which in turn spurred him to improve and modify the truck in an effort to soak up the abuse. 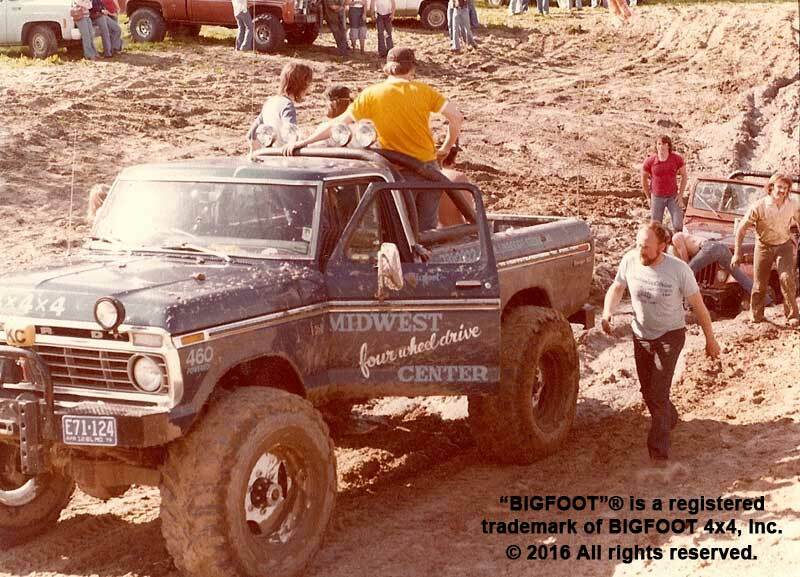 The truck and Midwest Four Wheel Drive began to garner a local following and a strong customer base, helped in part by the fact that Chandler and his family spent many a weekend at local off-road events and running the gravel-bottom rivers of southern Missouri. 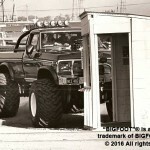 The Chandlers saw their truck as the best method to prove the quality of their shop and the products they sold; accordingly, Chandler drove the truck hard. 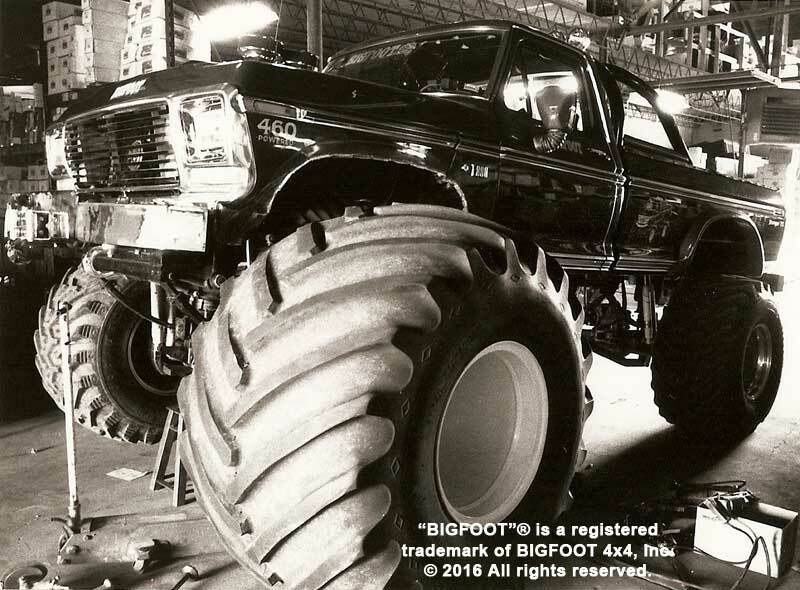 As the parts bills increased and the F-250 grew bigger and bigger, Chandler was soon nicknamed “Bigfoot” by one of his shop employees due to his heavy-right-foot driving style. 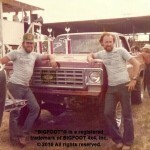 The nickname stuck, and soon the truck itself was christened “BIGFOOT”. 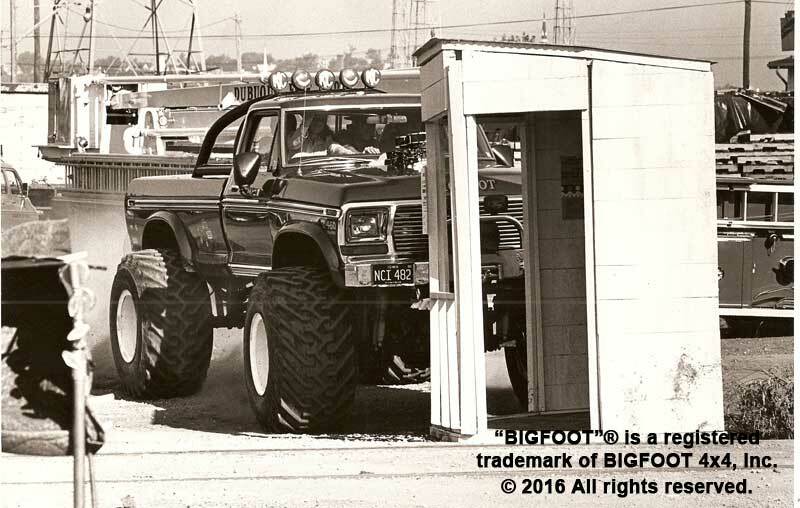 The shop was getting bigger, the trucks getting worked on in the shop were getting bigger, and of course BIGFOOT was getting bigger. 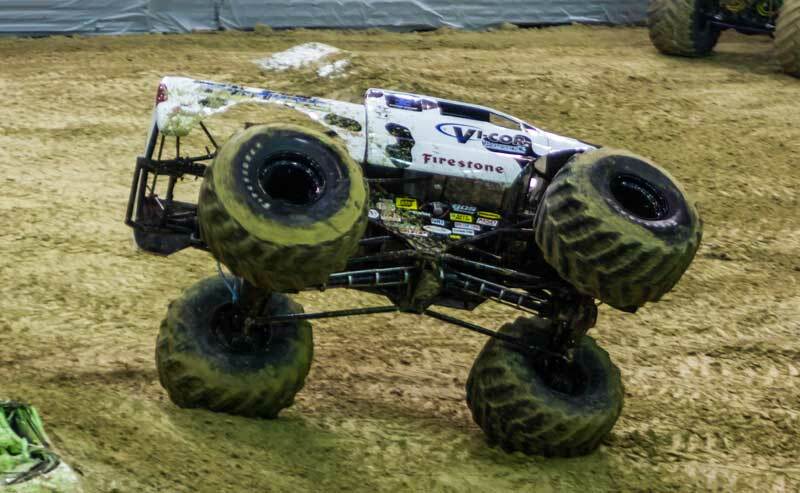 Bigger tires demanded bigger axles, which in turn dictated a bigger motor. 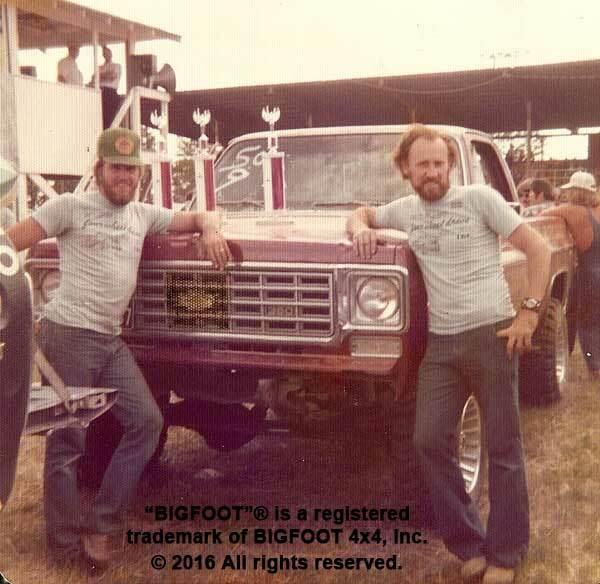 Bob and BIGFOOT soon began appearing and competing in local truck & tractor pulls, in addition to mud runs and off-road events. 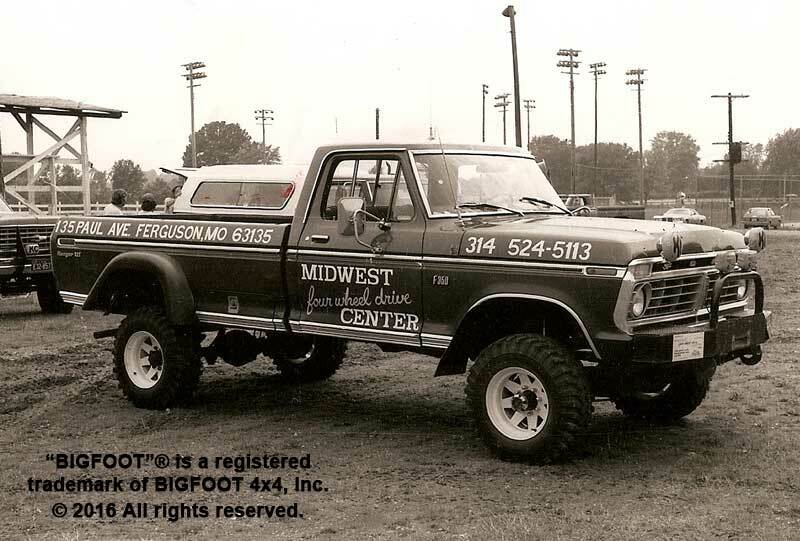 The BIGFOOT moniker soon became something of a household name in much of the Midwest. 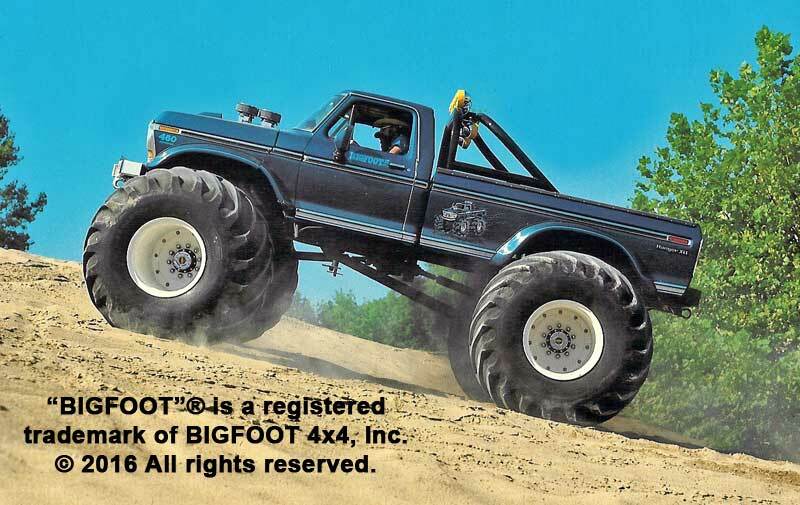 But word of this behemoth truck, which now featured military axles (complete with four-wheel steering), 48″ tall tires, and a souped-up 460 c.i. 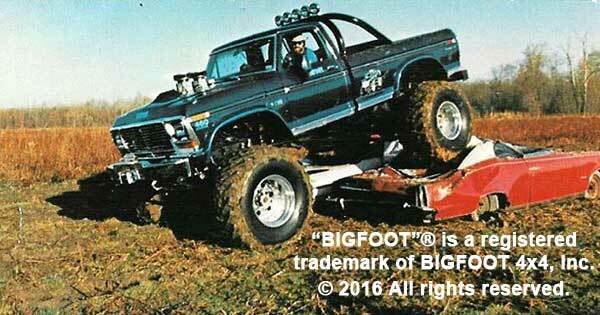 (cubic inch) big block V8 engine, was quickly spreading beyond the heartland. 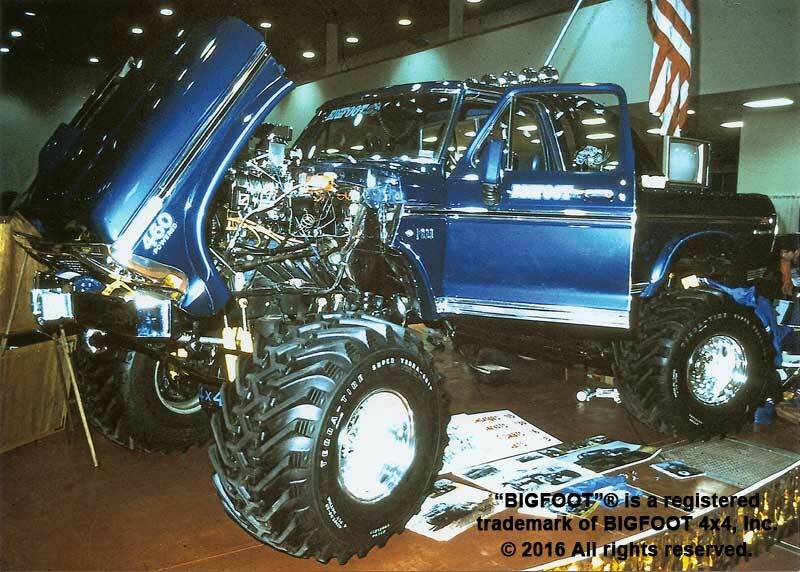 In 1979, Chandler and BIGFOOT made their first paid public appearance at a car show in Denver, CO. 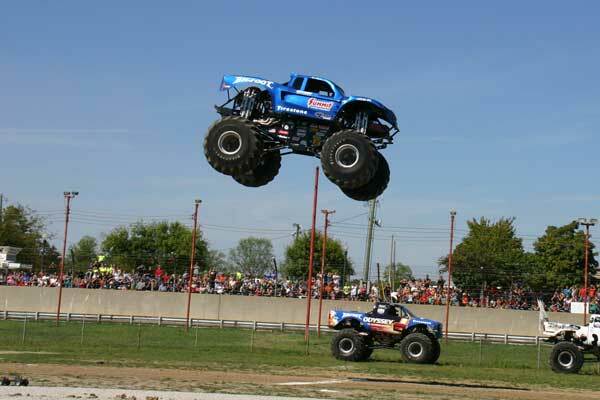 Soon thereafter, event promoters were booking the truck as a half-time act at truck & tractor pulls nation-wide. 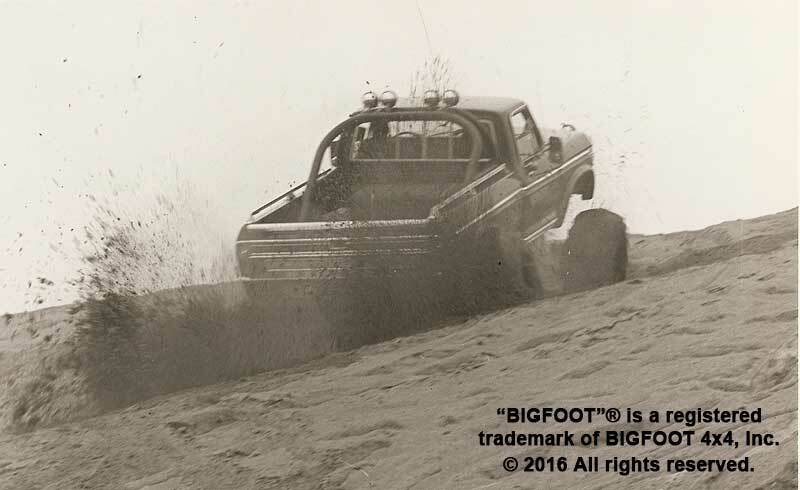 At some events Chandler would simply parade the truck around, showing off its rear-steering capability and its custom tilt hood; at other events, BIGFOOT would hook to the pulling sled and prove to the crowd that despite its show-quality looks, BIGFOOT was indeed a working truck. 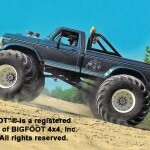 As BIGFOOT’s popularity on the live event circuit grew, national four wheel drive magazines took notice and soon BIGFOOT was a featured vehicle in a number of publications. 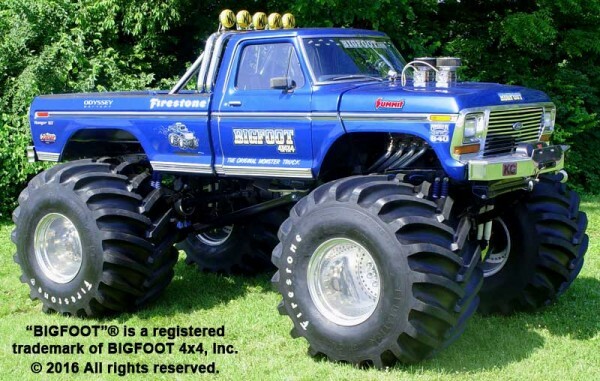 Despite BIGFOOT’s growing popularity, Chandler wasn’t one to slack off, so he continued to push his big blue truck in new directions. 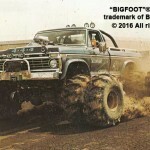 1981 would prove to be a watershed year for BIGFOOT. 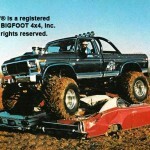 In addition to enjoying great success at various off road events, Chandler and his BIGFOOT truck (now dubbed a “monster truck” by the press) appeared in their first Hollywood film, “Take This Job and Shove It.” BIGFOOT’s debut on the silver screen caused the nation’s awareness of the truck to skyrocket. 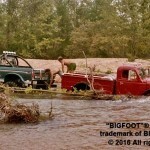 Many BIGFOOT fans might even argue that the truck was the best actor in the film! 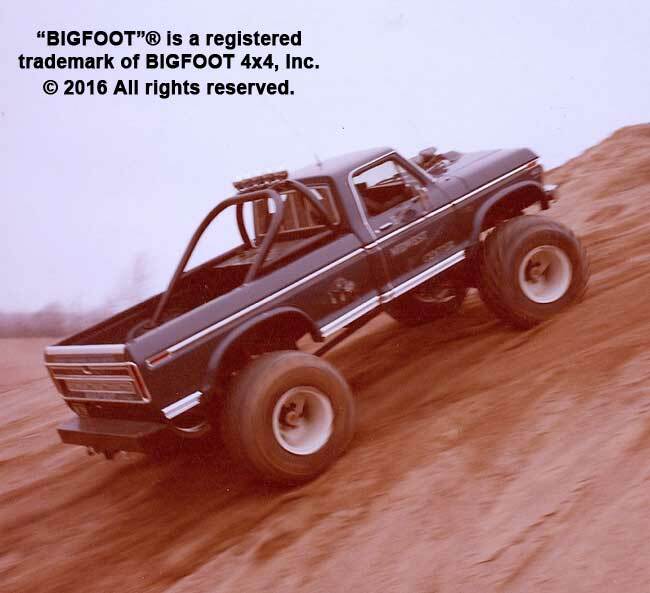 But beyond the film appearance, the hills topped and the mud bogs conquered, 1981 is known as the year that BIGFOOT and Bob Chandler became the first monster truck to do what monster trucks are now best known for: crushing cars. 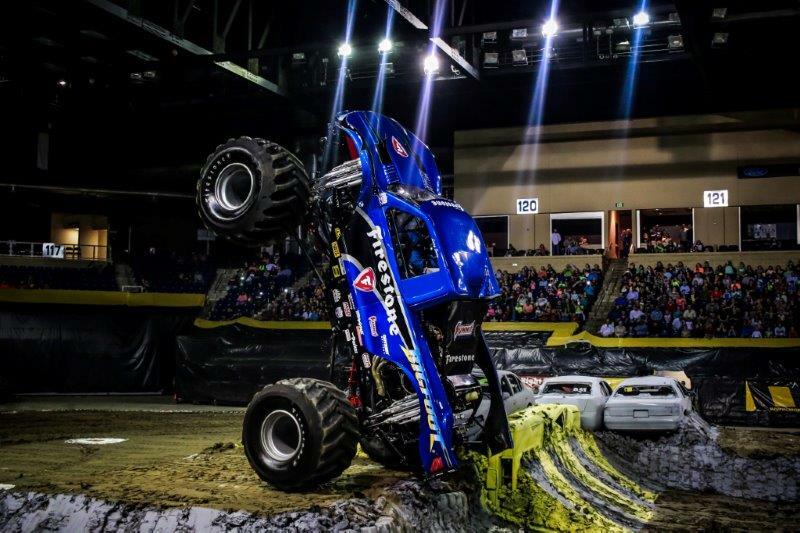 However, the first car crush did not take place in a packed arena or stadium, nor did it happen at a bustling county fair or mud bog. 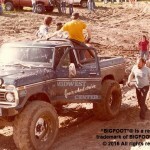 Rather, it took place in an empty cornfield in the rural Missouri countryside, with one video camera rolling and a small crowd of onlookers present. 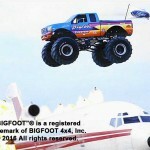 On a whim, just to see if he could do it, Chandler piloted BIGFOOT over a pair of junk cars parked side by side. 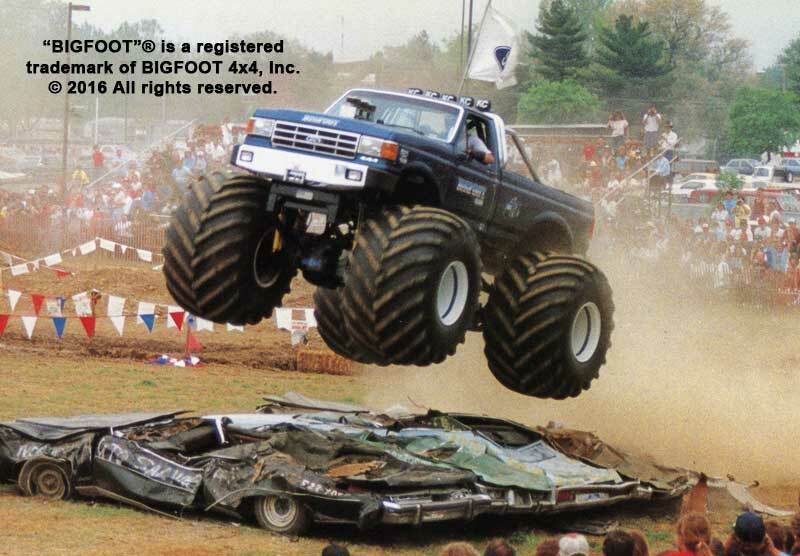 The truck bruised its way over the clunkers without so much as a whimper. 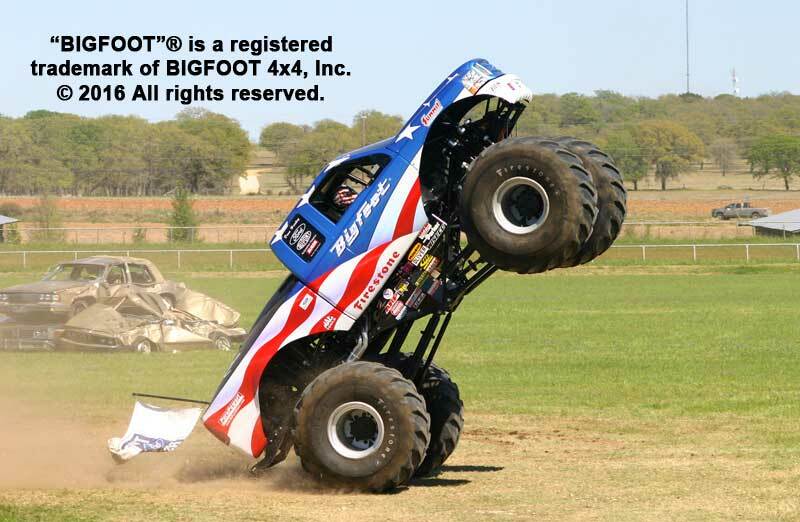 History had been made. 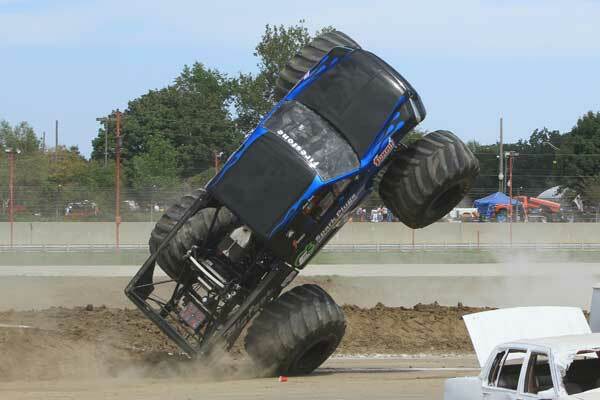 Shortly thereafter, a truck pull promoter saw the “car crush” video playing while at Midwest Four Wheel Drive, and, after some convincing, Chandler agreed to duplicate the stunt in front of a live audience at a truck pull. 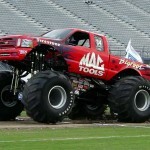 Chandler was initially reluctant to crush cars in public for fear that the seemingly destructive act would hurt the public’s positive opinion of the truck. 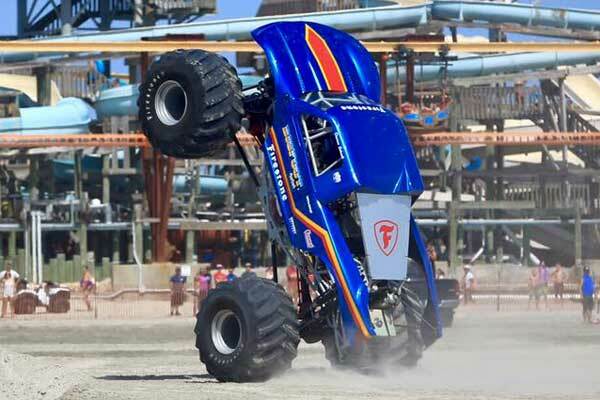 He eventually agreed to perform the stunt at live events, a decision that would prove to be the catalyst that ignited the monster truck industry’s meteoric rise in popularity. 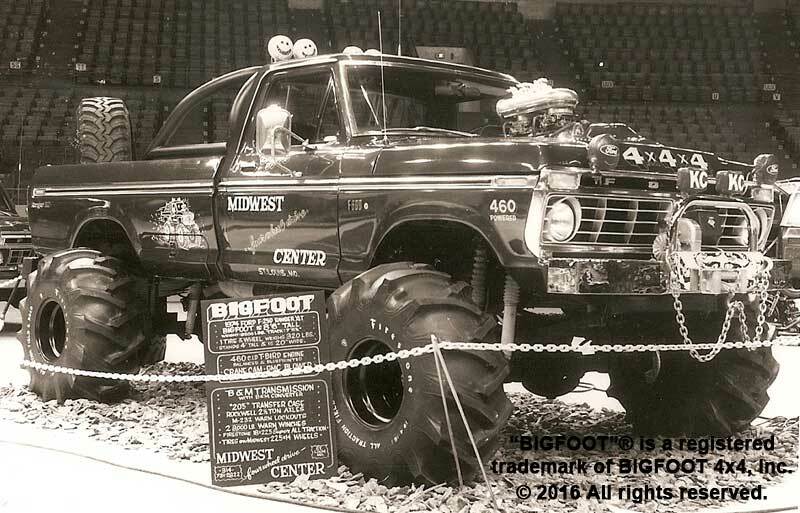 As the number of requested appearances for BIGFOOT grew, Chandler and his Midwest Four Wheel Drive crew were all but forced to clone BIGFOOT to meet the demand. 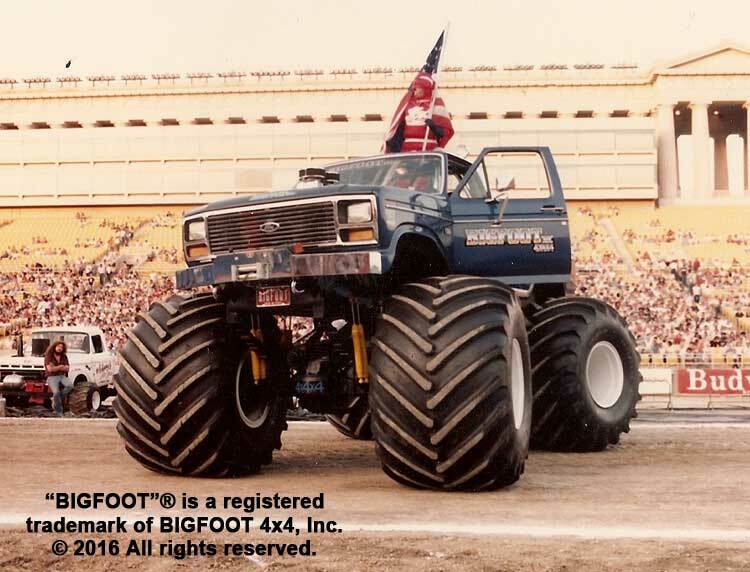 BIGFOOT #2 was born in 1982, and debuted at the Pontiac Silverdome in Detroit, MI late in that year. 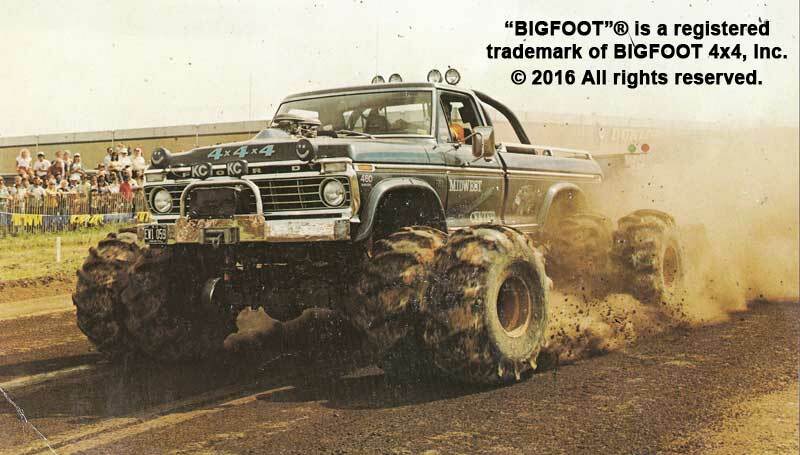 BIGFOOT #2 was the first monster truck to utilize the now industry-standard 66″x43″x25″ terra tires, more commonly referred to as “monster truck tires.” These tires immediately became the industry standard, and today help define what a “monster truck” is. 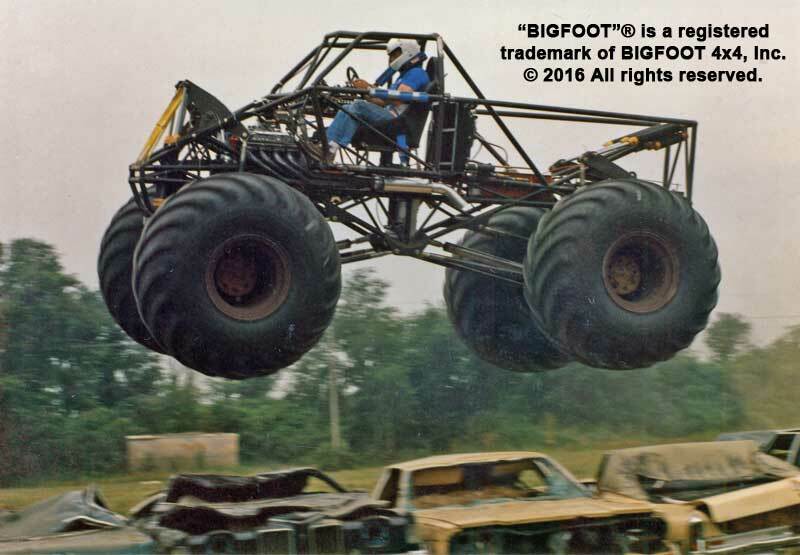 On the heels of BIGFOOT #1 and #2 was a growing field of imitators, capitalizing on the growing popularity of this new form of motorized entertainment. 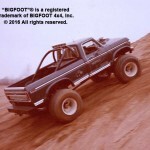 In 1983, Ford Motor Company became BIGFOOT’s first major sponsor, a partnership that would last for nearly a quarter of a century. 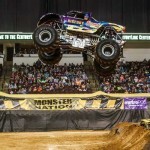 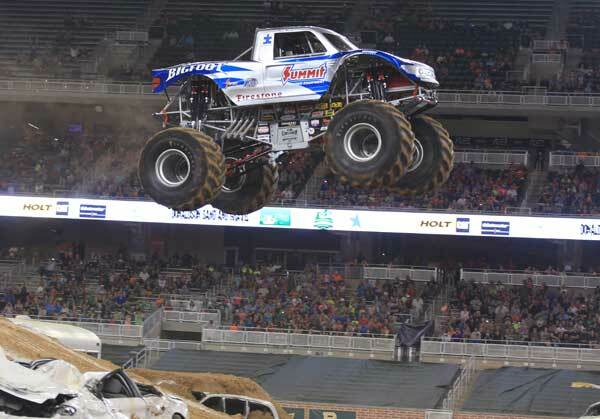 As the monster truck industry began to establish itself, the performance of the trucks themselves seems quite modest in contrast to the high-flying, high-speed events of today. 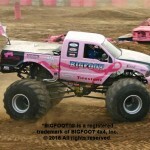 Initially, monster trucks would often be the “main event” at a tractor pull or mud run; at the end of the event, the truck would crawl up on top of a few junk cars to the roaring delight of the crowd. 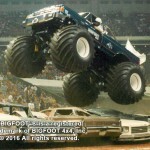 As the 1980’s progressed, so did the style of monster truck events; it wasn’t long before the main focus of the events shifted towards monster truck competition. 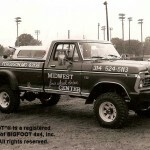 To keep up with the changing competitive environment, Chandler’s ever-growing BIGFOOT team (which had moved to a custom-built facility in Hazelwood, MO in 1984) continued to pump out newer and more competitive BIGFOOT trucks to keep up with the public demand, and to stay ahead of the competition. 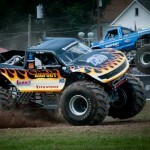 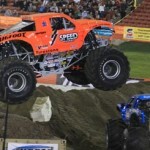 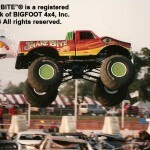 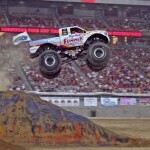 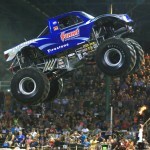 It was during the early days of monster truck racing that the first “stage two” monster truck was built, BIGFOOT 4. 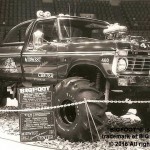 A stage two truck was purpose built as a monster truck, as opposed to taking a factory stock pickup and modifying it for “monster” duty. 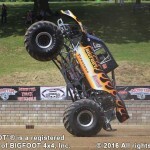 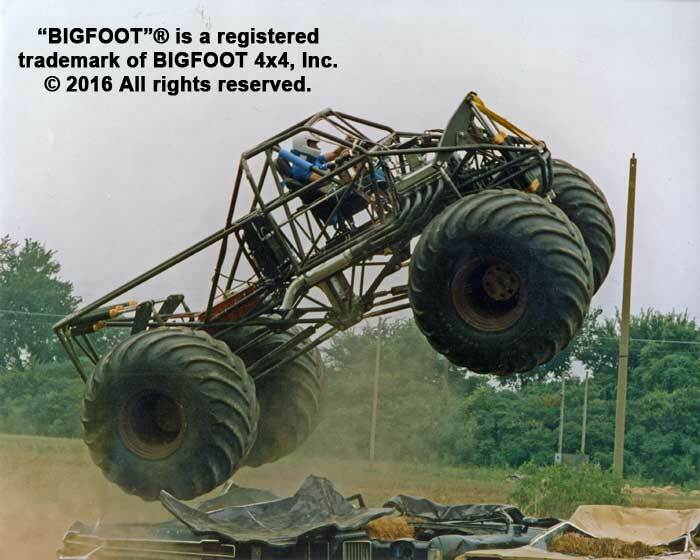 Utilizing a fabricated heavy duty box frame, in addition to planetary equipped axles right from the get-go, BIGFOOT 4 was the next step in monster truck technology. 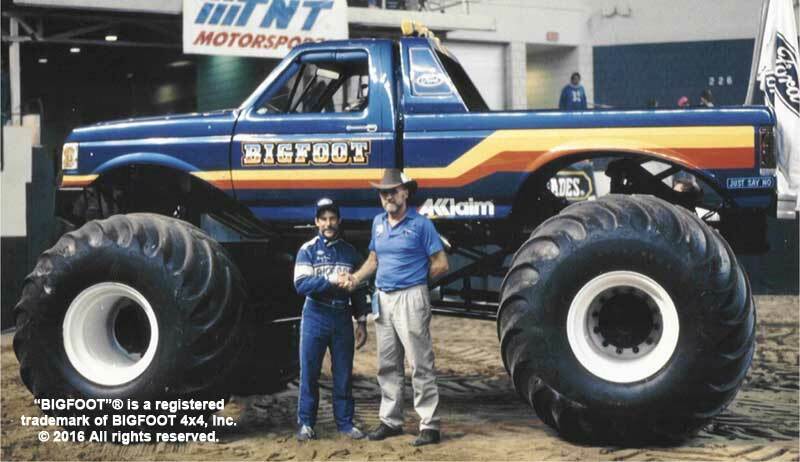 Bigfoot 4 (along with legendary driver Jim Kramer) would dominate the mid-late 80’s monster truck scene. 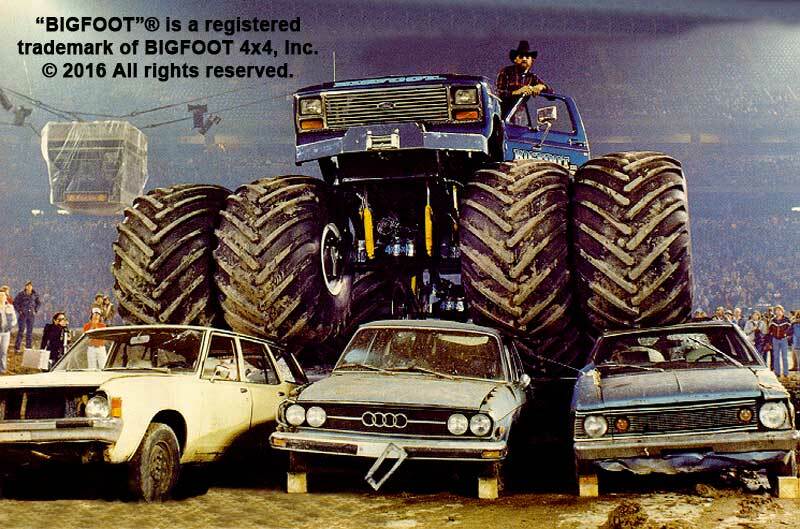 The 80’s also saw a monster truck “arms war” take place, where a battle was taking place between owners to see who could build the biggest & baddest truck. 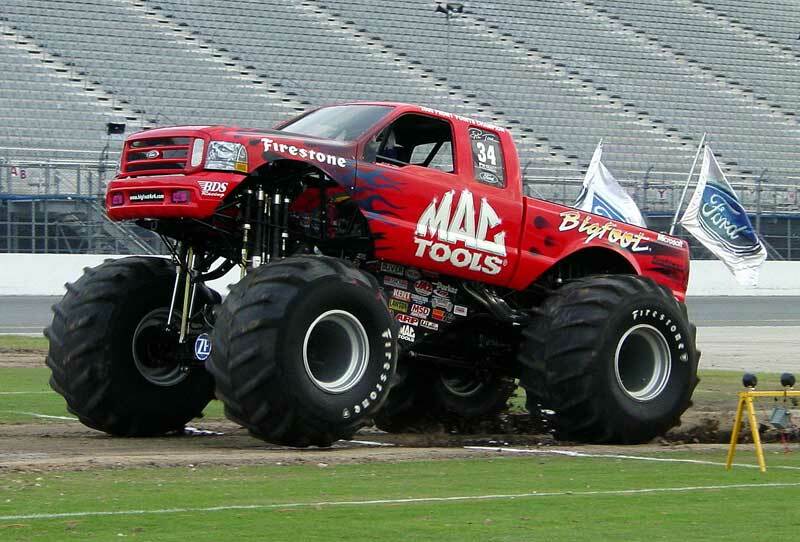 Tire size kept increasing, the amount of shock absorbers reached comical levels, & many trucks sported enough auxiliary lighting to illuminate a stadium. 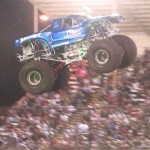 Bob Chandler decided to end this competition once and for all. 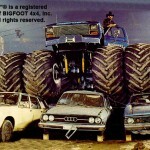 He came across a set of 10 foot tall Firestone Tundra Tires in a junk yard near Seattle, WA. 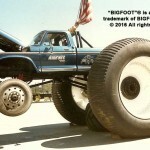 He decided to mount them under a BIGFOOT truck and see how they looked. 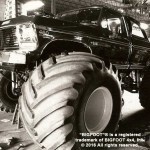 It was a major hit with fans. 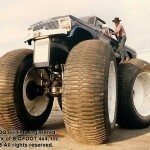 Bob then decided to purpose build a truck to handle these goliath tires. 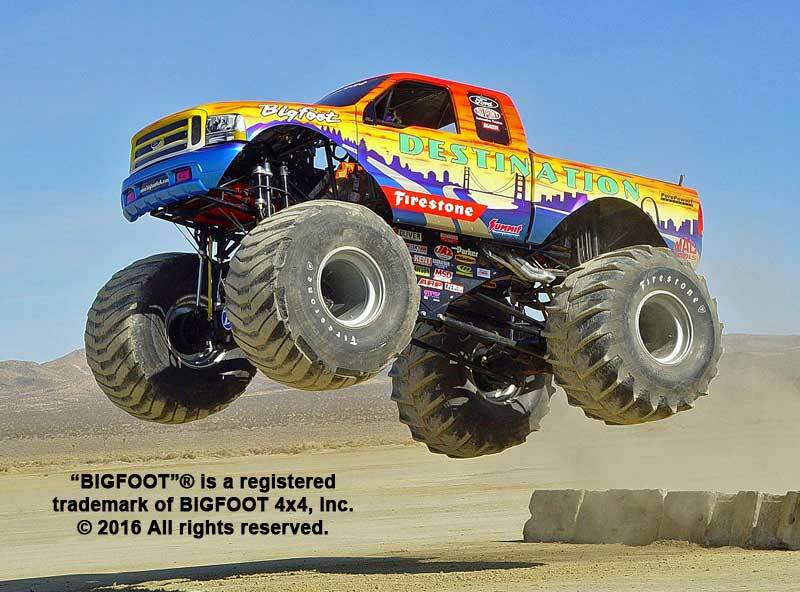 The result was BIGFOOT #5, the tallest & widest pickup truck in the world (as noted by the Guinness Book of World Records). 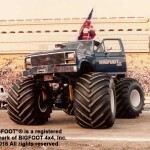 The monster truck industry turned its focus towards all-out racing in the late 1980’s, and it was at that point that Chandler saw the need for a major technological leap forward in the name of safety and performance. 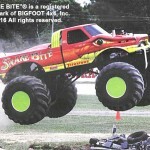 Existing monster truck designs were not exactly prime examples of high technology at the time. 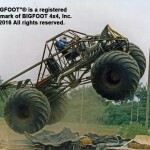 They featured stiff leaf spring-based suspensions that were rough and offered little in the way of travel, which of course took its toll on drivers. 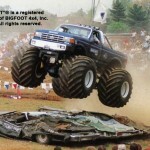 Most trucks at the time also utilized steel pickup truck bodies, mounted atop heavy steel frames. 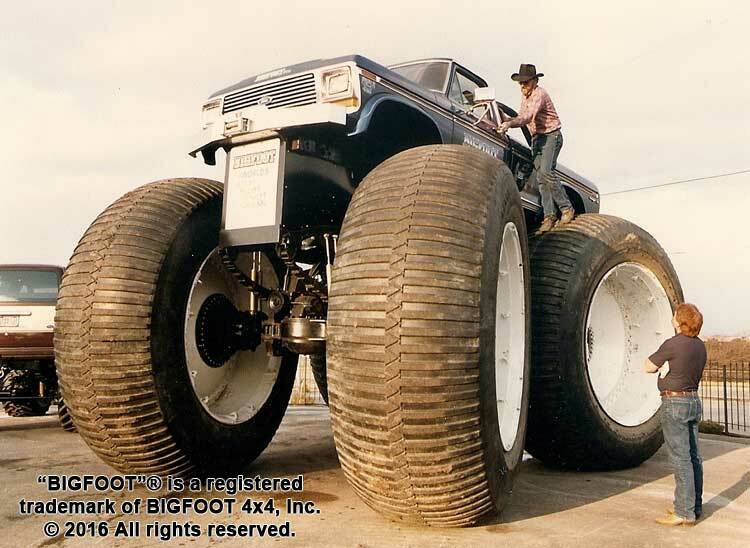 All of that combined with heavy military axles and full-cleat tires added up to one thing: a very cumbersome monster truck, often in excess of 15,000lbs. 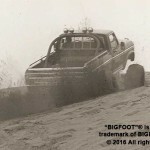 Despite their heavy weight, the high-horsepower engines that teams were using in the trucks were propelling them to speeds in excess of 60mph. 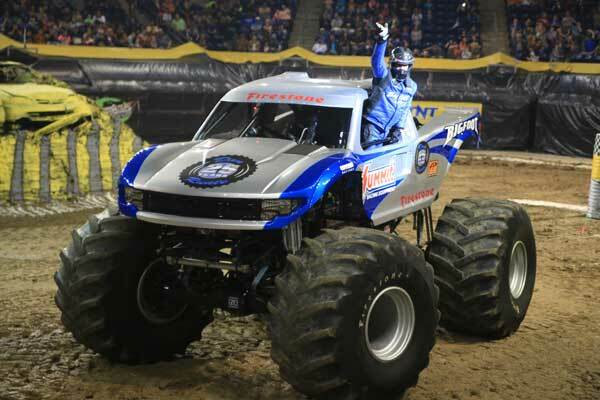 The industry had reached a point where the trucks could dish out more than the drivers could take, and Chandler decided something needed to be done. 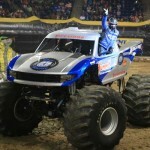 Using Computer Aided Design (AutoCAD) technology, Chandler was able to create a new generation of monster truck (dubbed Stage III) that featured a radical tubular steel chassis design and patented cantilever suspension system. 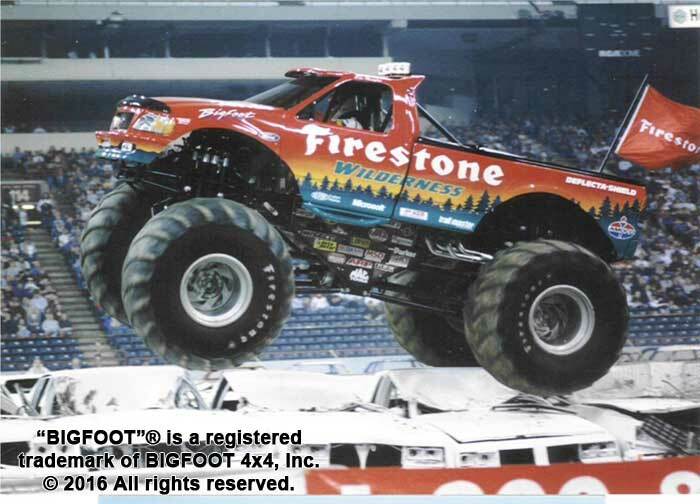 The first of these new trucks was BIGFOOT #8, which was completed in mid-1989. 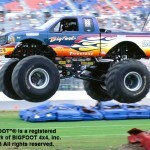 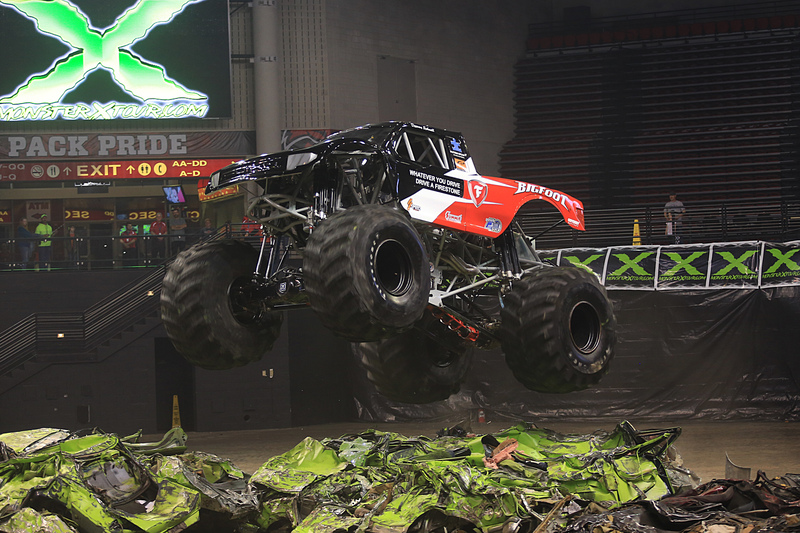 BIGFOOT #8 quickly leapt to the forefront of the monster truck world, and in its first full year of competition became the 1990 World Champion. 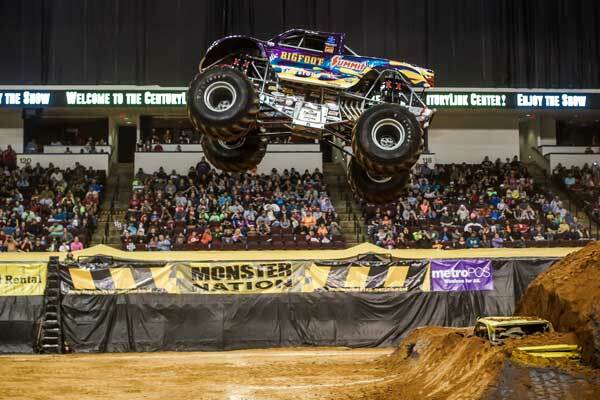 Since that time, the vast majority of monster trucks have adhered to the basic concept of using a tubular steel chassis and long-travel nitrogen-charged shocks. 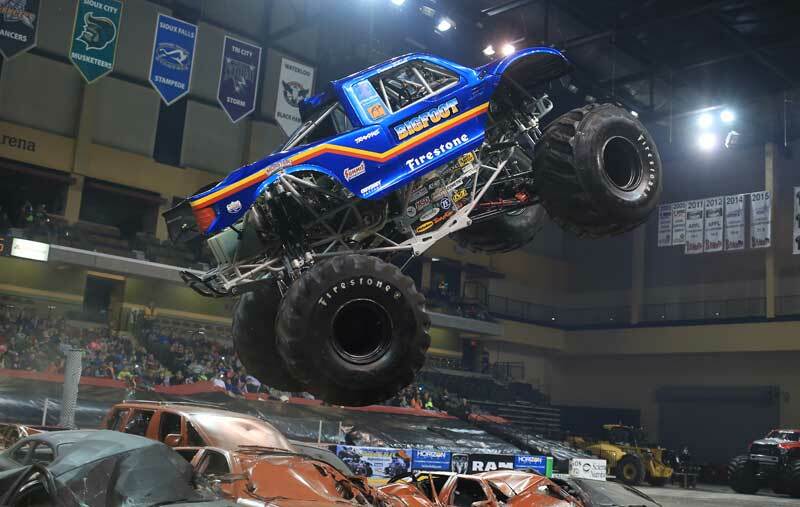 This style of truck combines speed, light weight, and agility with an extensive roll cage and fiberglass body that makes for a safer, better performing, and easier to fix monster truck. 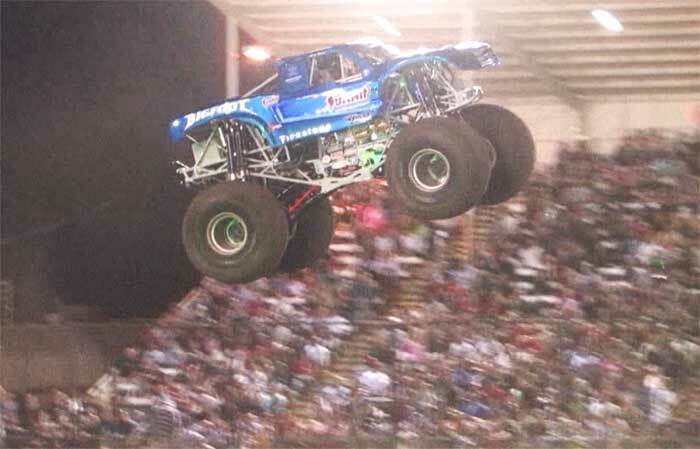 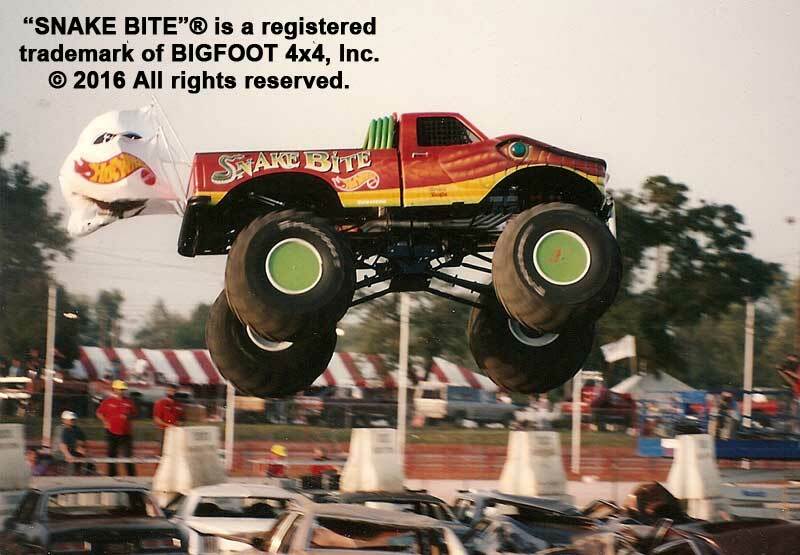 In 1991, the BIGFOOT team debuted the first 3-D character-bodied monster truck, “Snake Bite®”. 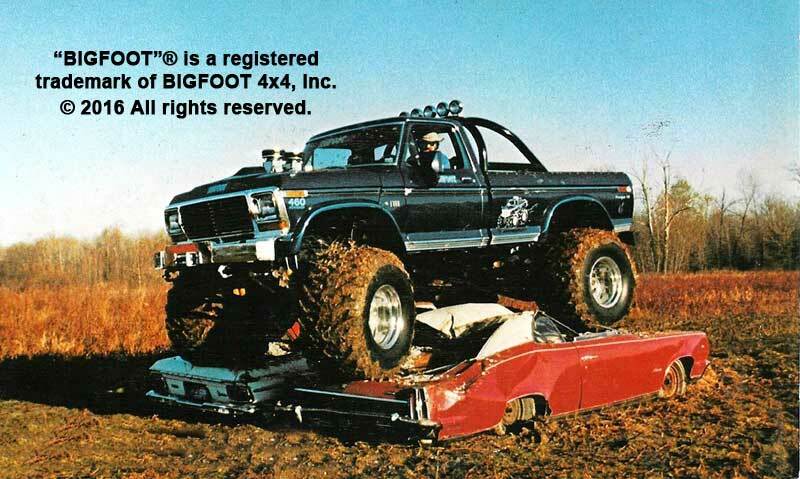 Snake Bite featured a custom fiberglass front end that was shaped to look like a menacing snake. 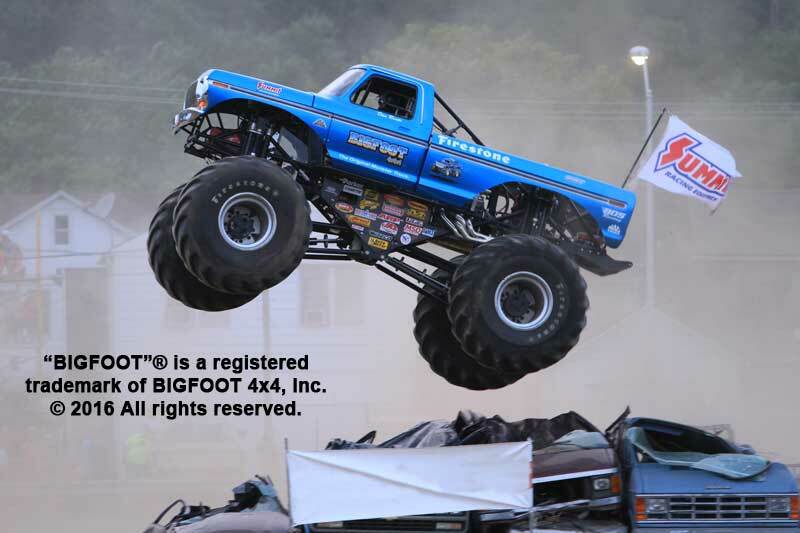 This afforded the BIGFOOT team the opportunity to campaign multiple vehicles at an event without using two identical-looking vehicles. 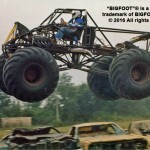 The fanged monster also proved to be a merchandising powerhouse. 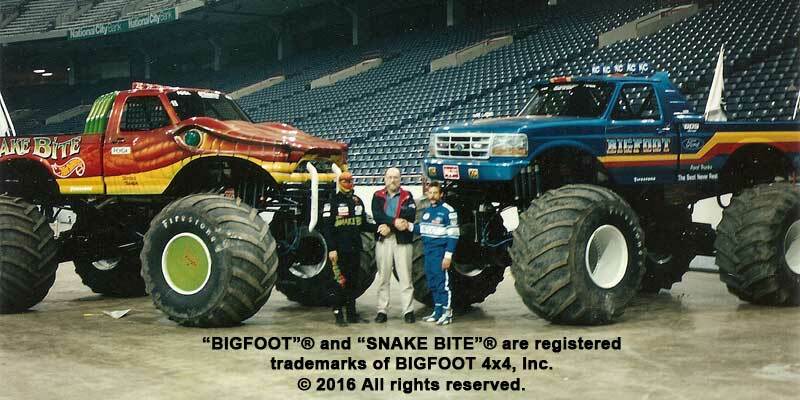 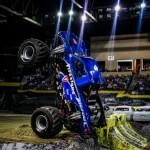 Since the inception of Snake Bite, dozens of monster truck teams have copied the idea and developed 3-D bodies of their own. 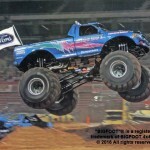 In 1992 Chandler became the first owner in the sport to utilize a team approach in a racing series, using multiple trucks with different bodies/identities to compete for a championship. 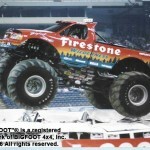 In the 1992 season BIGFOOT #10 and teammate Snake Bite (running on the BIGFOOT #8 chassis) raced to a 1-2 finish in points. 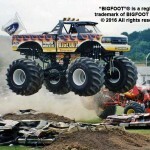 In 1994 the team completed a sweep of the top three spots in points. 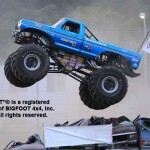 Since that time, Team BIGFOOT has gone on to finish in first or second place nearly every year. 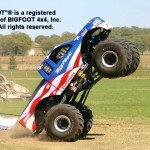 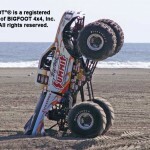 BIGFOOT also has a licensed BIGFOOT team in the United Kingdom that operates BIGFOOT #17. 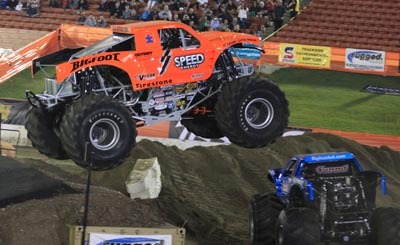 BIGFOOT #17 is owned and driven by Nigel Morris, who has claimed three championships since 2003. 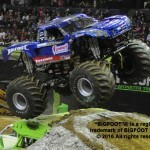 To date, Team BIGFOOT has amassed 50 championships! 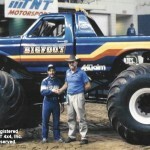 Since his introduction of BIGFOOT #1, Bob Chandler has not only been a successful team owner and innovator, but also one of the leaders in pioneering advancements in monster truck safety. 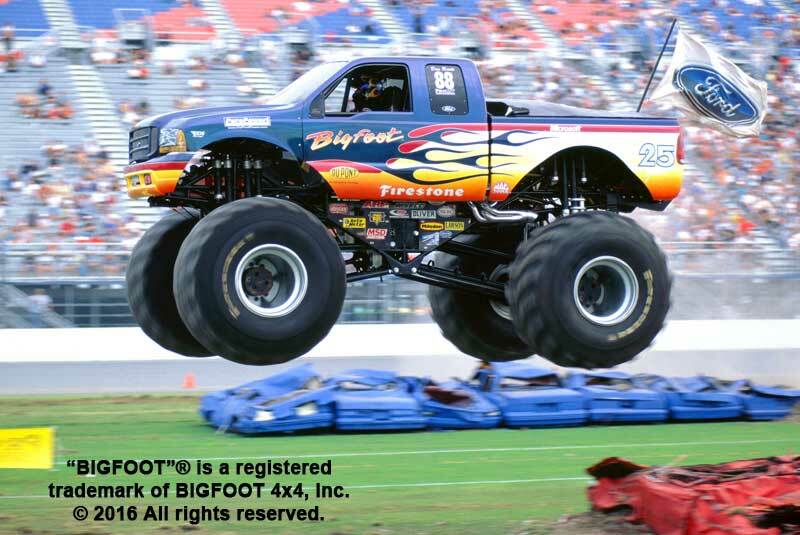 In 1987, Chandler helped co-found the Monster Truck Racing Association (MTRA), an organization dedicated to maintaining a complete monster truck rule book in an effort to promote safety, industry-wide. 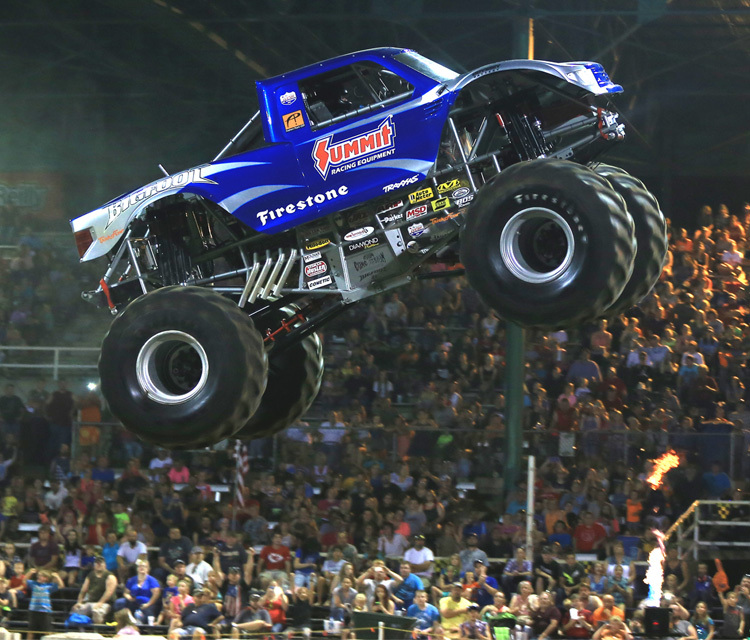 One of Chandler’s greatest contributions to the sport was spearheading the development of the now-standard Remote Ignition Interrupter (RII). 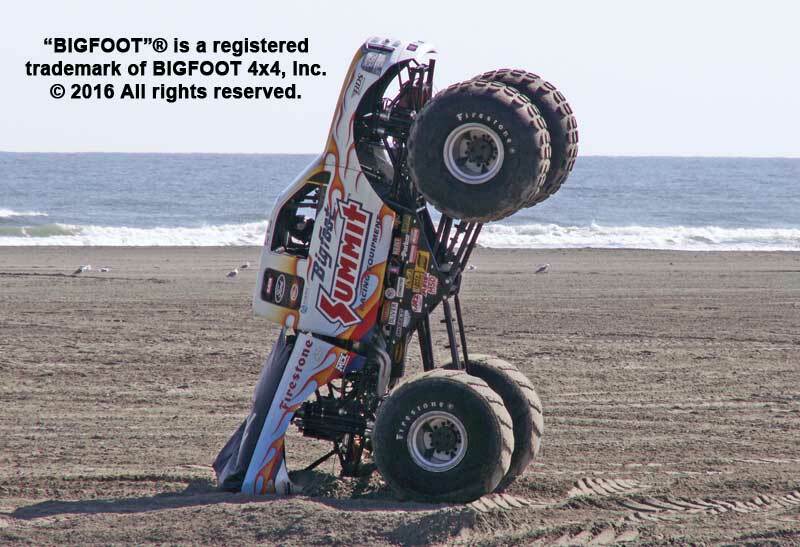 This allows a truck’s ignition system to be remotely disabled by a team member or track official on the sidelines, should a driver lose control of the vehicle or should a situation on-track that the driver is unaware of dictate such action. 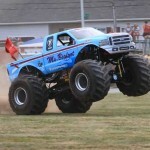 With the assistance of European BIGFOOT owner/ driver Nigel Morris, the MTRA’s European division (MTRAE) was formed in 2001. 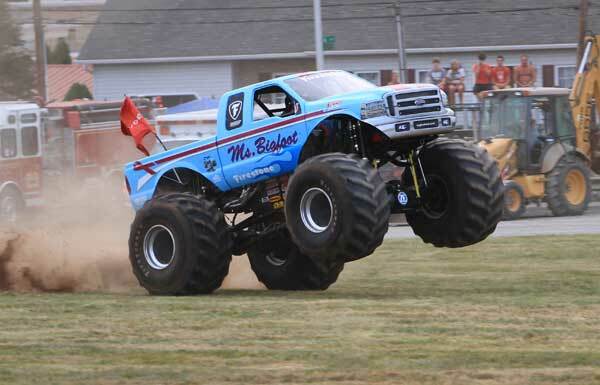 One of the key aspects to BIGFOOT’s success, in addition to the hard work and leadership of Bob Chandler, has been the continued support and equally hard work contributed by Bob’s wife Marilyn (who, notably, was the first woman monster truck driver), his long-time associate Jim Kramer, and the entire BIGFOOT team over the years. 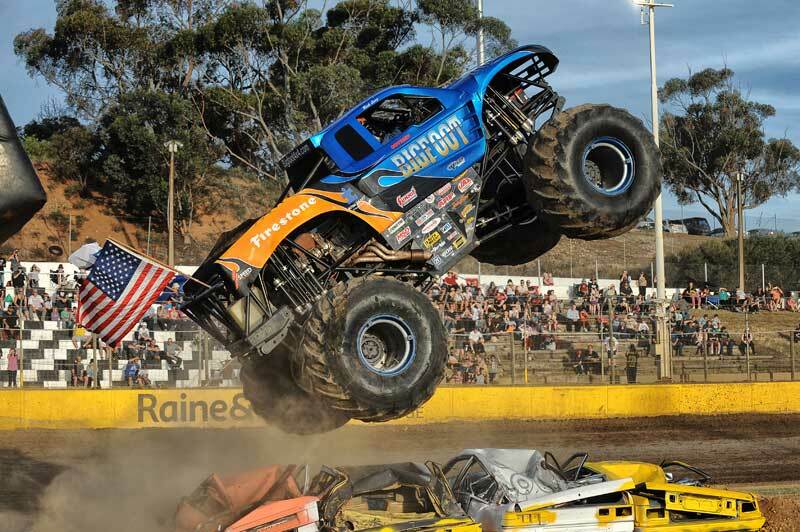 Kramer is widely understood to be the first “hired gun” behind the wheel of a monster truck, and has left his mark as one of the most skillful and successful racers in the sport’s history. 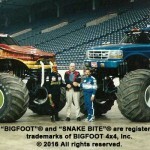 Kramer’s cool hand behind the wheel and professional speaking ability in front of the cameras and fans helped him become one of the sport’s most recognizable personalities. 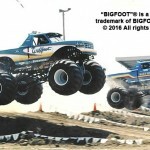 Kramer still is a driving force behind the BIGFOOT operation today, helping with many of the team’s R&D projects in addition to assisting with sponsorship’s and new driver training duties. 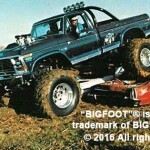 The list of accomplishments compiled by the BIGFOOT team over the last 44 years is quite remarkable, and seems to nearly be unending. 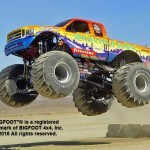 BIGFOOT has visited more than 26 countries and has appeared in seven Hollywood films, ranging from “Take This Job and Shove It” to “Charlie’s Angels: Full Throttle”. 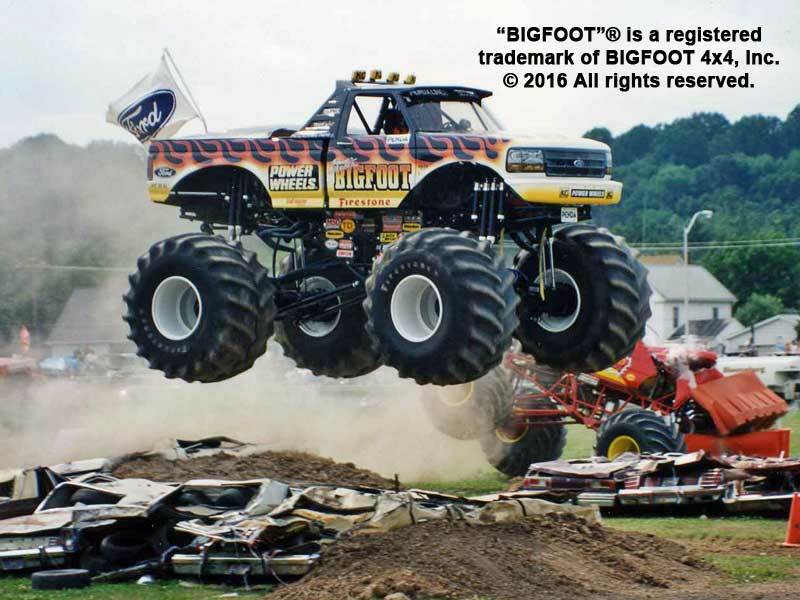 Chandler and his BIGFOOT team and trucks have appeared in literally hundreds of TV shows, from televised races to cartoons to documentaries. 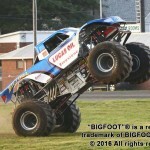 Corporate America was quick to take note of the marketability and positive public perception of BIGFOOT, and today the team counts a “who’s who” of automotive and aftermarket companies as their sponsors, including Firestone, Summit Racing Equipment, Odyssey Battery, Lucas Oil Products and many more. 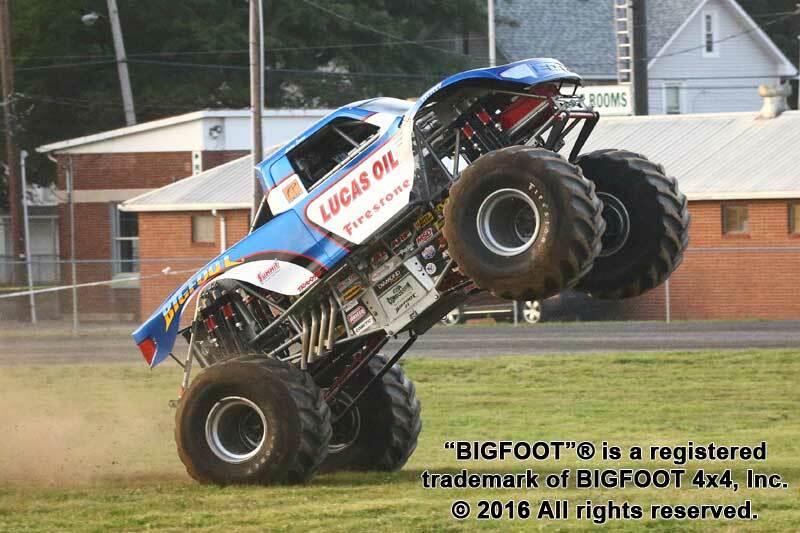 The team continues to investigate new ways to incorporate sponsors into their program, both automotive and non-automotive related. 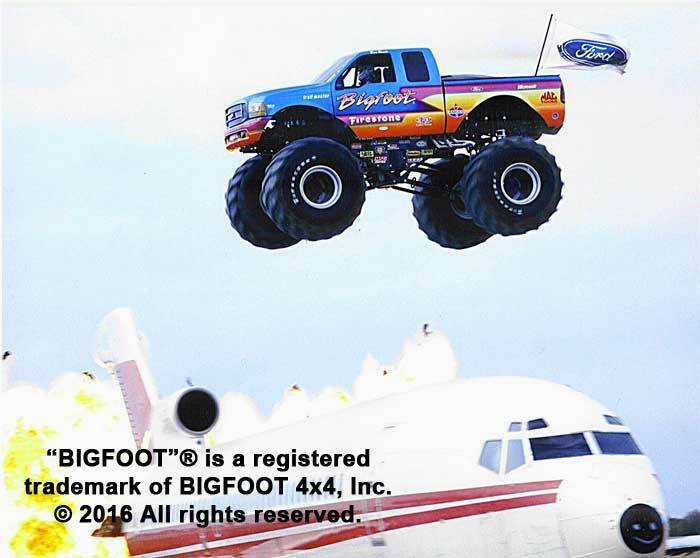 Adding to the team’s clout was the announcement in late 2009 that BIGFOOT had been named one of the Top 5 Marketing Vehicles of all time, an honor shared by some (literally) lofty company that included the US Navy Blue Angels and the US Air Force Thunderbirds, among others. 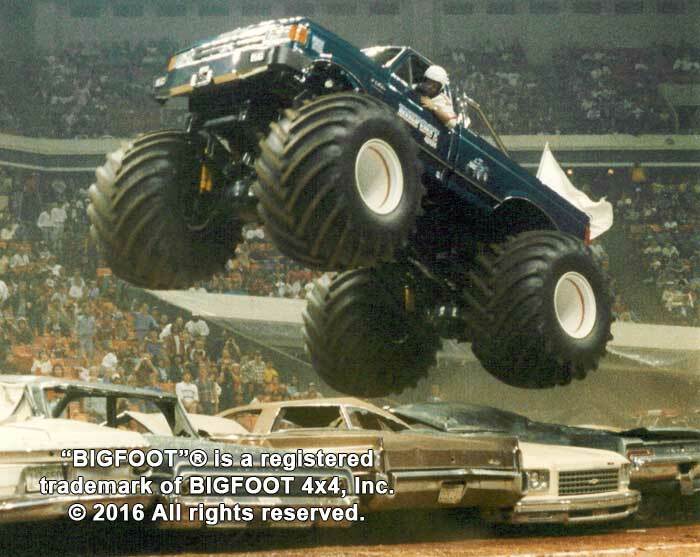 BIGFOOT #5, #14 and #18 have all held or hold Guinness World Records, the most recent of which was #18’s astonishing long jump of 214’8″. 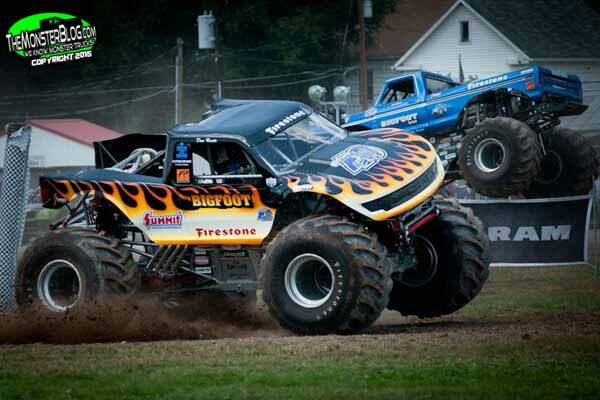 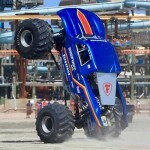 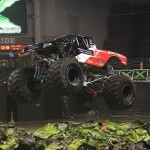 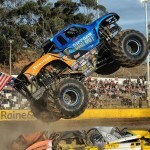 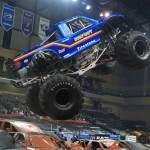 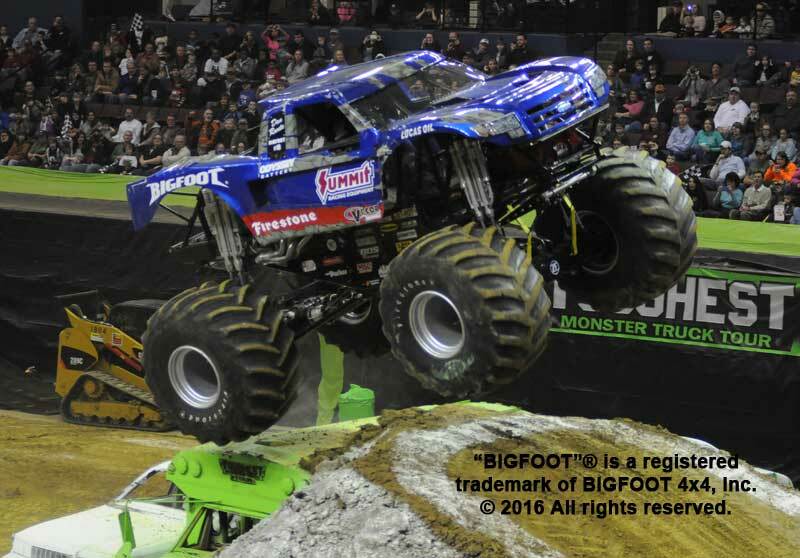 Furthermore, in 2012, BIGFOOT #20 was completed and is the world’s first and only battery-powered monster truck! 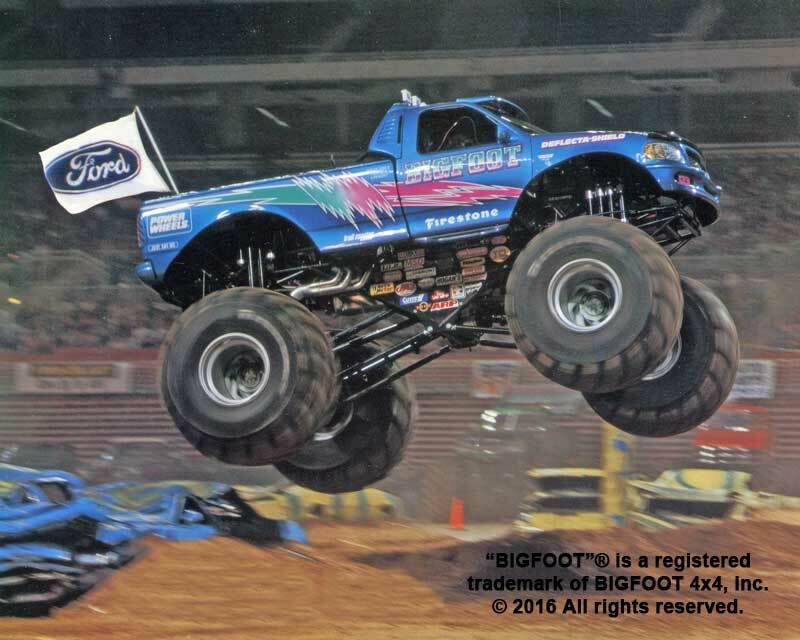 BIGFOOT #21, the newest truck in the fleet, first appeared in 2015 and #22 is in the works. 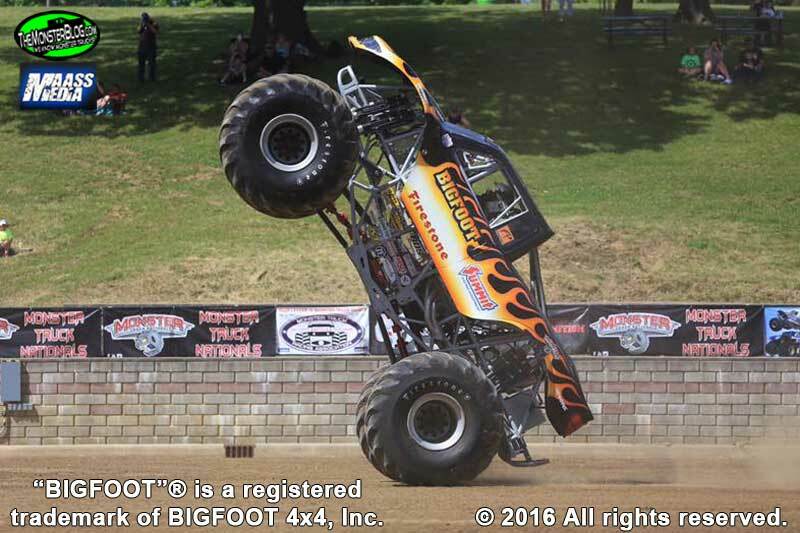 With over four decades of history-making behind them, Chandler and Team BIGFOOT show no signs of slowing down. 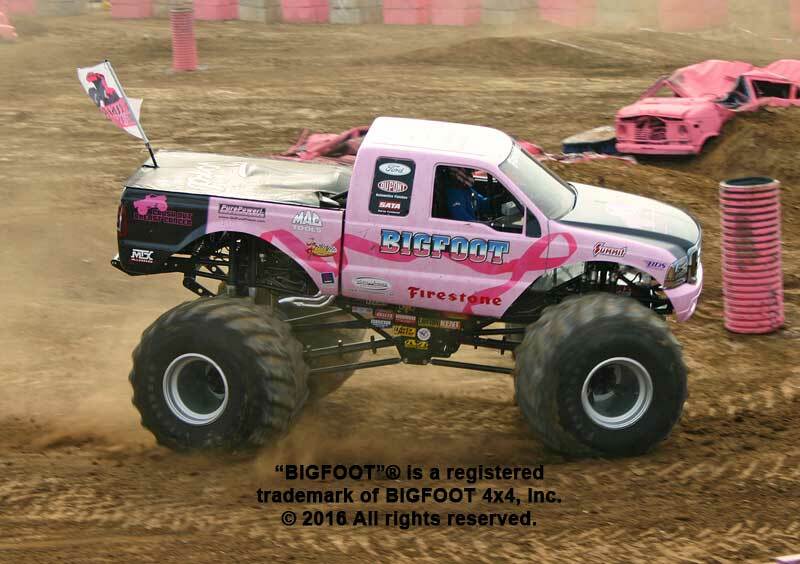 As the monster truck industry continues to grow beyond anyone’s wildest dreams, you can rest assure that Team BIGFOOT will continue to set a high standard of class, performance, and innovation. 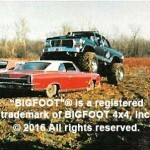 CLICK HERE for a more detailed biography of BIGFOOT owners/creators Bob and Marilyn Chandler.